CaribbeanWeddings.com® is designed to help you choose the wedding and honeymoon of your dreams. Getting married in the Caribbean is one of the most popular choices for couples today. So if you are planning a Caribbean wedding or a Caribbean honeymoon you will want to make sure you check out our recommended Caribbean wedding resorts that specialize in Caribbean weddings and honeymoons. Whether you choose Aruba, the Dominican Republic, Cancun or any of the other beautiful islands in the Caribbean the information you will find on our site will help you make the right choice. A Caribbean wedding will ensure you enjoy this very special time in your life. 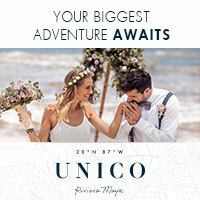 We provide extensive information about each island, the recommended hotels that specialize in destination weddings, hotel recommendations and connections to hotel websites, legal requirements of each island and all you need to know to have a stress free and beautiful Caribbean wedding and honeymoon. We have worked in the Caribbean since 1978 and we launched CaribbeanWeddings.com in 1999 with the intent to assist couples looking for a destination wedding in the beautiful Caribbean, select the right destination and the perfect hotel. CaribbeanWeddings.com is the official website of Caribbean Weddings, Inc.